So what if…I had twin girls??? Since I fell in love with the Up, Up & Away theme I decided I would use this no matter what I was having. In order to be prepared I created design boards for all three scenarios…girl/boy, boy/boy and girl/girl. In this post I showed pictures of my gender neutral nursery, and I also posted a design board for twin boys. Now, the twin girls design board! Originally I was inspired by aqua, red & white for twin girls, but then I found this beautiful photo and I decided to go with an aqua, pink and white color palette instead. The room has a much more soft, feminine look with its ruffled curtains, gathered cribskirts and an amazing floral ottoman. Also, while I loved the hot air balloons that I used in my gender neutral nursery, I did not think the colors available worked with this color palette. Instead, I found this mobile which I think works perfectly. 1. Benjamin Moore Antiguan Sky. 2. Sometimes the Dreams that Come True… I love a great inspiration quote in a nursery. 3. Mobile from Restoration Hardware Baby. 4. The ruffled panel has a blackout liner too…from PB kids 5. Hot Air Balloon photography 6. Graphic Art Design pillow from Soeuralasoeur on Etsy. 7. Painted Monogram from woodwallletters on Etsy 8. 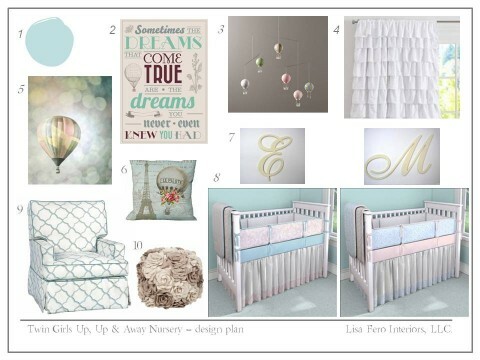 Custom designed coordinated crib bedding. 9. Lydia swivel glider from Rosenberry Rooms 10. Floral pouf from Rosenberry Rooms… also comes in red. You can also view my Up, Up & Away Pinterest board which has some other great product that can be used for this theme.